OracleOracle CTO Larry Ellison took jabs at Amazon from stage on Tuesday. Oracle founder Larry Ellison said “it’s kind of embarrassing” for Amazon that it uses Oracle’s databases to power its own business – especially considering Amazon offers its own databases that compete with Oracle’s. Ellison was responding to a report from last week that Amazon intends to get off of Oracle’s products completely by 2020. While Amazon is a customer of Oracle’s, they are also bitter competitors, thanks to the success of Amazon Web Services. 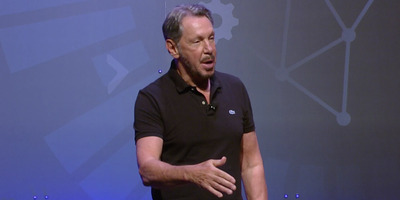 Oracle founder and chief technology officer Larry Ellison went on stage Tuesday to announce a new database feature. But it wasn’t long before Ellison did what he seems to love doing at big events: roasting Amazon. Last week, CNBC reported that Amazon plans to end its internal reliance on Oracle technology, which underlies some parts of its business. It’s notable, because Amazon’s market-leading Amazon Web Services cloud has been attacking Oracle’s core database business for the last few years. Ellison offered his thoughts on the report, saying that other Oracle competitors like SAP and Salesforce.com have tried their own, similar moves, and none of them succeeded. In fact, he all but accused Amazon of hypocrisy for selling their own database products to customers, while relying on Oracle’s own databases to run its own business. Amazon recently spent $US60 million on Oracle databases, a figure which Oracle shared last week in the wake of the CNBC report. Beyond poking at Oracle’s biggest competitors, Ellison announced Tuesday that the company’s nearly one-year-old Autonomous Database can now do so-called Autonomous Transaction Processing, or ATP. Oracle’s Autonomous Database uses machine learning to do routine database management, historically performed by humans. With the new ATP features, the Autonomous Database can now “support a complex mix of high-performance transactions, reporting, batch, IoT, and machine learning in a single database, allowing for simpler application development and deployment, and enabling real-time analytics, personalisation, and fraud detection on live transactional data,” in Oracle’s own words.